brrr°’s Triple Chill Effect imparts a measurable cooling sensation to a wide variety of end products. Atlanta-based brrr° was founded by entrepreneur Mary-Cathryn Kolb, a sales veteran with several major brands. While working at Spanx Inc., Kolb developed an interest in textile technologies. “At Spanx, I became very intrigued with how we can make something so powerful, but invisible,” Kolb said. “And my curiosity for that led me down the path of textile technology.” Kolb identified a need in the industry for an authentic cooling technology, and after working with scientists in Taiwan to bring her ideas to life, brrr° was born. The patented technology centers on what brrr° has branded the Triple Chill Effect. Unlike some cooling fabrics that focus on wicking alone to provide cooling, brrr° combines a special fiber core for increased wicking ability and proprietary fabric structures for maximized airflow with a “secret sauce” comprised of natural minerals that have the ability to cool the skin on contact and the ability to continuously cool. The brrr° minerals begin life in a powder form, which is melted, extruded and chopped into pellets so they may be combined with thermoplastic polymers during melt spinning. 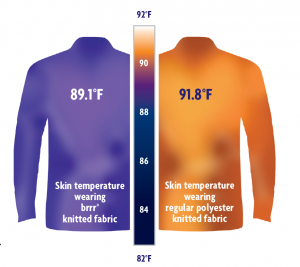 The amount of brrr° additive used depends on the final fabric composition, desired amount of cooling as well as other fiber properties and the intended end use. 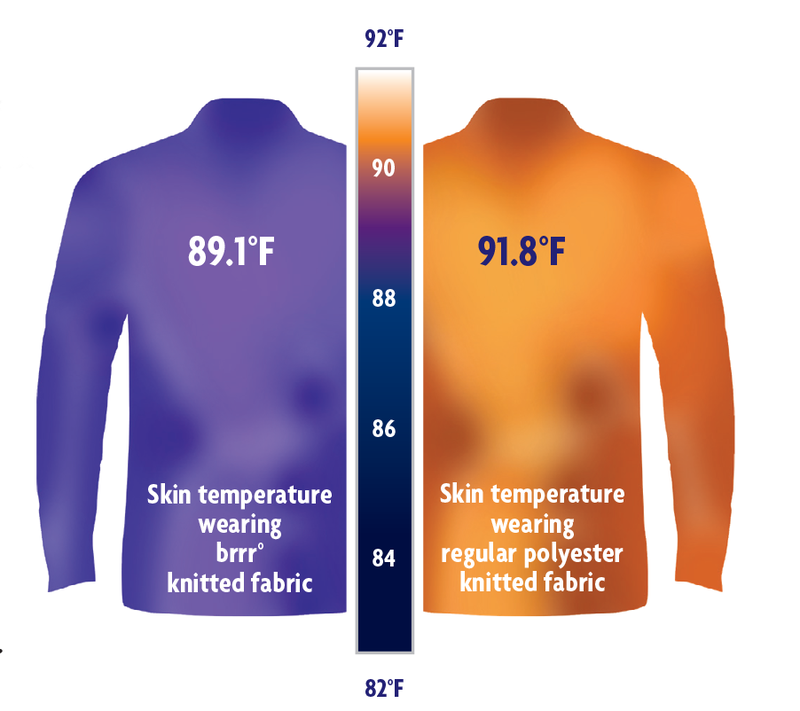 Thermal testing shows brrr° fabrics draw heat away from the skin and provide instant and continuous cooling that does not fade or wash out. According to Kolb, more than two years of product testing has led the company to claim that the cooling effect — brrr° can reduce skin temperature by up to 3°F over 20 minutes of normal wear as measured using the Hohenstein Watson Cooling Test #16.1.14.0024 — is proven cooling. When tested using the industry standard Qmax Cooling Test FTTS-FA-019, the scores for brrr° fabrics are anywhere from 30 to 85-percent better than those for virgin nylon, polyester or cotton. Two options are available to manufacturers. They may purchase brrr° yarns and become a certified user of brrr° yarns. Currently, polyester and nylon filament yarns are available, although other polymers may be used, and the company is looking into incorporating brrr° during other spinning methods to expand the family of yarns that are available. 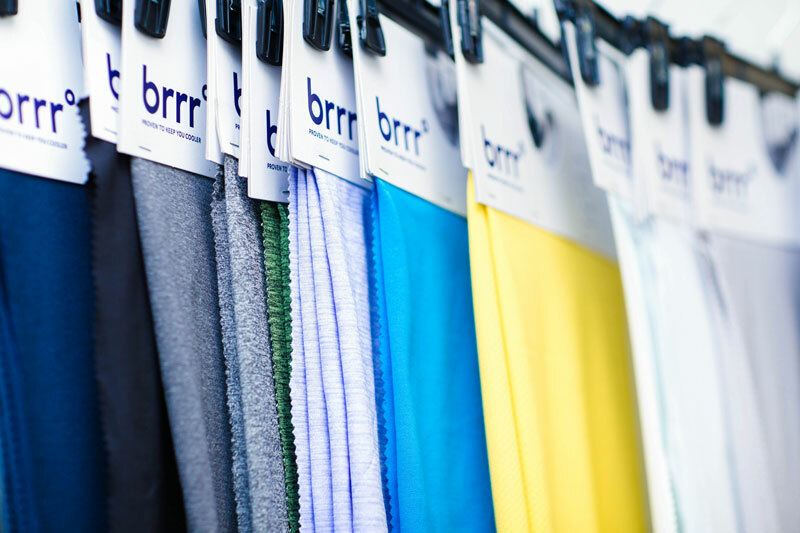 Or, manufacturers may buy fabrics featuring brrr° from the company, and the company offers product development assistance through its Taiwan-based manufacturing facility. Brands are taking notice. brrr° has programs in place with several well-known brands including The Gap Inc., Jos. A. Banks, Men’s Wearhouse, Argent and Downlite. 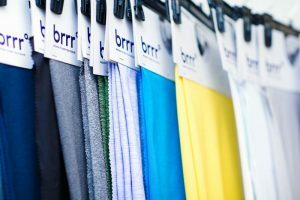 brrr° currently is found in bedding, athleisure wear, golf apparel, automotive products, denim and formalwear. But one market that has not yet opened up is medical. Kolb sees enormous possibilities for the cooling technology in medical products. “I believe there is such proactive care by having brrr° in the medical space and that’s something I’d like to uncover,” Kolb said. For more information about brrr°, contact Julie Brown, +270-361-9338; jbrown@brrr.com; brrr.com.